The plane landed in Dublin before six o’clock and, though I paid extra for an early check-in at nine am, we still had time to kill before we could nap. Jared wanted coffee, so we set off on an early morning quest for a cup of joe. We walked for an hour and returned to the B&B around seven. At seven-thirty we had breakfast and settled into the lounge to wait for our room to be available. Every half-hour we checked in with them. By ten, we were more than exhausted and angry, to boot. So we took another walk. We finally got into the room at eleven and slept for three hours. We made it out again around three o’clock. After taking the bus into Dublin center and getting a bit to eat, it was five and all of the sights were closed. So we walked. 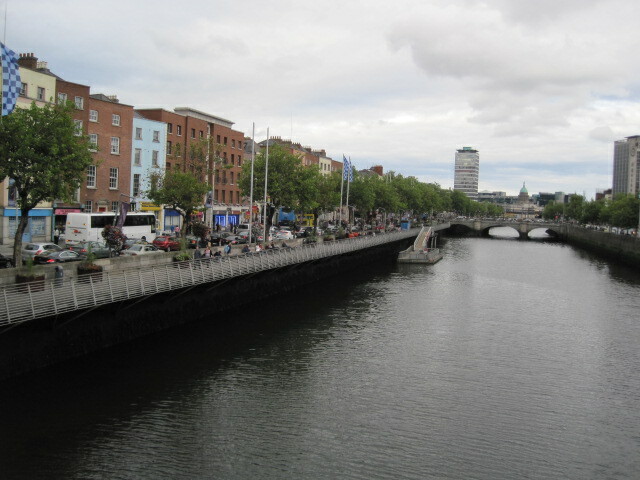 Temple Bar, Trinity College, the Ha’penny Bridge. All of that walking had a terrible consequence. 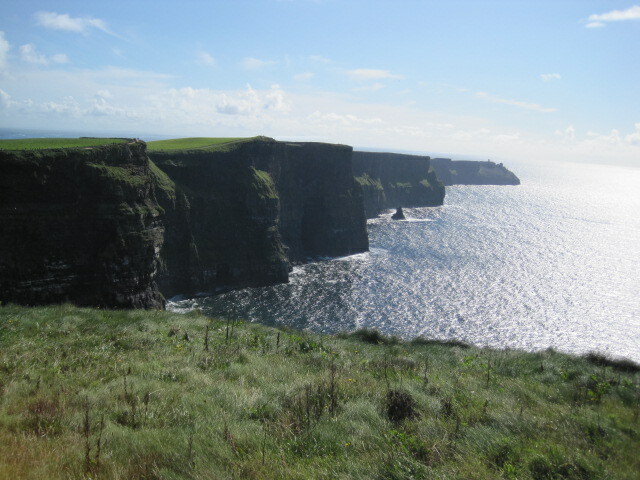 Many have died falling from the Cliffs of Moher because of the unstable rock ledge and perilous, winding paths. Beyond the crowded tourist center and dreaded rows of busses is a large sign warning people not to go further because of the danger. But the designated viewing spots—far from the edge with a four-foot wall in front—didn’t quite offer the expected experience. 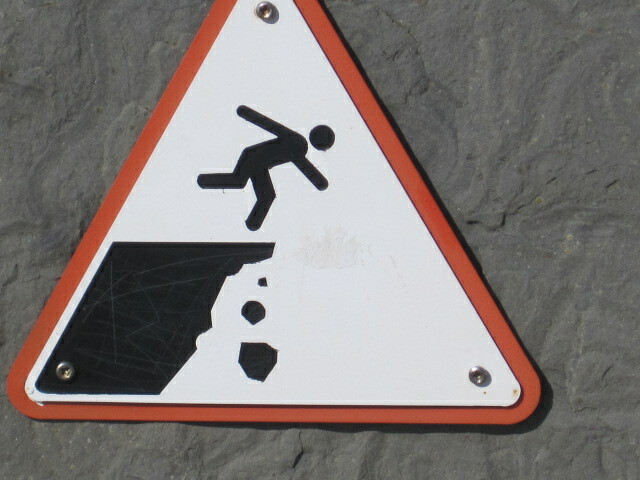 So, along with about thirty percent of the other tourists, we ignored this warning and followed a winding path that, at times, ran just along the edge. Being terrified of heights, I was skeptical of this plan, but was convinced to move forward. The scariest part was the bounding tourists, rushing to return to their busses before the designated ninety minutes was up. I feared one would shove me to my death while galloping down the path. It was not this that did me in, however, but a 2-foot high rock wall that needed scaling. I should have lifted my right leg a half-inch higher. My sneaker caught on the lip of the rock and I tumbled to the ground. Luckily, away from the cliff*. Though my leg is nicely bruised where it slammed into a well-placed rock and my biceps feel like I just finished a full workout because I expended so much energy bracing myself. 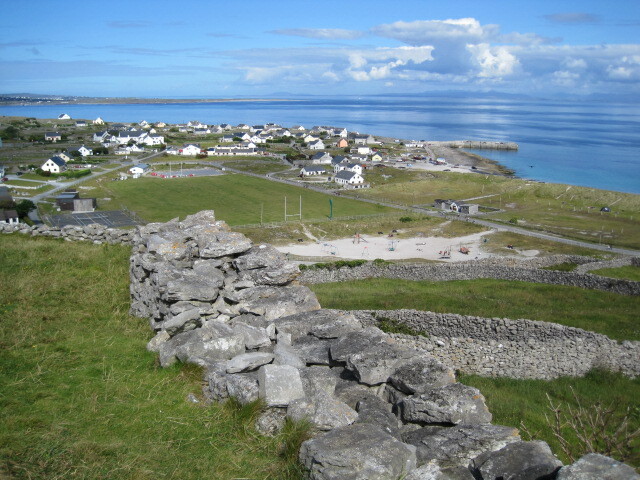 Ah, Inisheer. Pretty, quaint, boring. I should have listened to the Irishman who, in a pub the night before, warned me that it was nothing more than “a lot a rocks”. Instead, I heeded the advice of the ferryboat salesgirl and chose Inisheer over Inishmor, as the latter was labeled too touristy. After braving the crowds at the cliffs, I was looking for a more authentic experience. The views were outstanding. But beyond that, there wasn’t much to do. With our blistered feet, a long walk was not appealing. 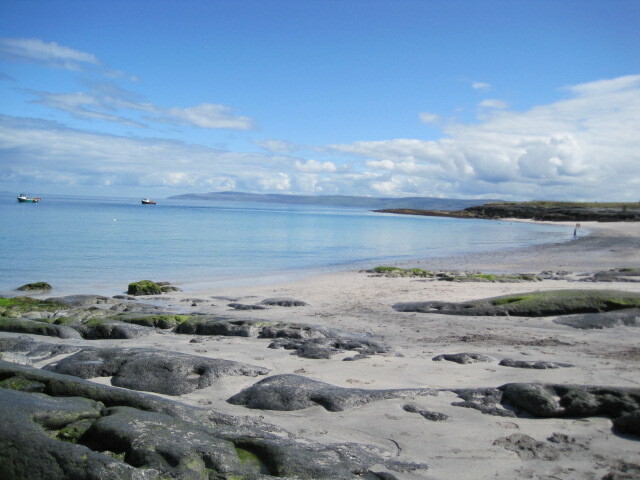 So we took a tractor ride to the other side of the island, ate lunch, leapt around on the craik (aka big, flat rocks), then proceeded to wait in line on the pier hoping to get an earlier passage back to Doolin than we had originally purchased. The sun was unrelenting, so we took a short walk to an ice cream stand, bought two cones, and stood in the shadow of the truck. There are no trees on the island. No shade. Thankfully, there was space on the fourth ferry, and we didn’t have to wait another two hours to leave. While seated on the boat, I noticed that Jared’s face was flushed. Upon closer inspection, I realized that his forearms, ears, cheeks and forehead were actually bright red. (I was a little toasted as well, but have SPF30 moisturizer so I was okay.) Who the hell manages to get sunburned in Ireland? *I was not actually in any danger and was nowhere near the edge when I tripped. Don’t worry, Linda.